Is nothing sacred anymore? Earlier this year it was reported that you do not really need crystals for crystallography (although the initial enthusiasm seems to have cooled down a bit) and now we have a report here by Pronin et al. that a substitution reaction on tertiary carbon can be stereoselective as in SN2. To quote Wikipedia: ' tertiary substrates do not participate in SN2 reactions, because of steric hindrance. ' and yet Pronin found a loophole. The substrate in his proof of concept is an tert-alkyl trifluoroacetate, the Lewis acid catalyst is scandium triflate , the nucleophile / solvent is trimethylsilylcyanide (TMSCN) and the product is an isocyanide. The rationale for the observed stereoinversion is the formation of an intimate ion pair. So far so good. The difficult part as always is the prior art. No citation is given for any article presenting stereoinversion at any tertiary carbon. On the other hand a citation is given for a reaction of a tertiary halide with TMSCN (dating back to 1981) but not with stereoinversion and one citation is given for a stereocontrolled isocyanation of an alcohol (2006) but by a different reaction type. Another difficult part is the reaction mechanism. The interesting bit is that the reaction apparently only works with the nucleophile as solvent e.g. in large excess. The complete solubility of scandium triflate in TMSCN also has to be accounted for. How can this be explained? 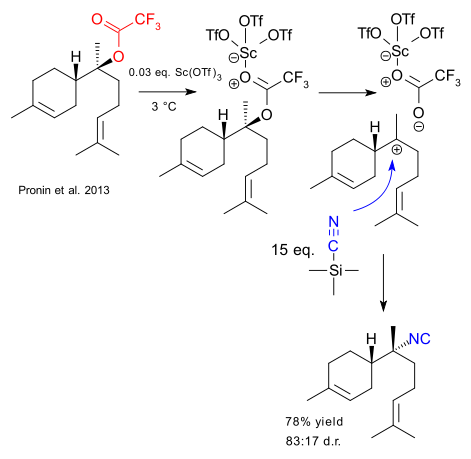 In the mechanism presented here the Lewis acid activates the carbonyl group in a well-established manner. Pronin et al take a different view: they suspect the presence of something like Sc(TMSCN)n(OTf)3 and the larger steric bulk would indeed favor the intimate ion pair mechanism. On the other hand the proposal has no literature precedent and the article does not even provide a hint. Of course, the reaction is expected to be very slow so a large excess of nucleoplhile makes all the difference. 14 September 2013 - Again? Interesting concept. Randomly select two chemicals from a commercial catalogue and find out what happens when you mix them. Take for example benzopinacol and n-butyllithium just as Zalibera et al. did here. What happens? Just as benzopinacol is formed from benzophenone in a pinacol coupling through a ketyl , the base makes sure benzopinacol reverts back to the ketyl. To quote the authors: "we have shown that non-ionic bases are able to reverse the pinacol coupling, inducing cleavage of the central bond in benzopinacol and producing ketyl radical anions." But hold on, in 2013 nobody has ever tried to throw a base at a pinacol product before? The discovery is too good to be true? A quick search engine investigation leaves no doubt. Screttas already in 1995 (DOI) reported that "benzopinacol undergoes decomposition by an alkoxide base to diphenyl ketyl, which decays into an equimolar mixture of benzophenone and benzhydrol". So now where is the novelty? Same reaction but with a different base or same reaction investigated with a different technique? It is not that the article does not cite other work but not as relevant work (DOI, DOI, DOI). Interesting challenge for reviewers: make sure the novelty claims made in articles actually hold up.